Ensuring your kids eat seasonal produce means they are getting fresh food and the optimal nutrition. Shopping at local farmers markets and eating seasonal fruits and vegetables are great for children as they taste better and are full of nutrients! The vitamin content of fruits and vegetables decreases rapidly after picking. 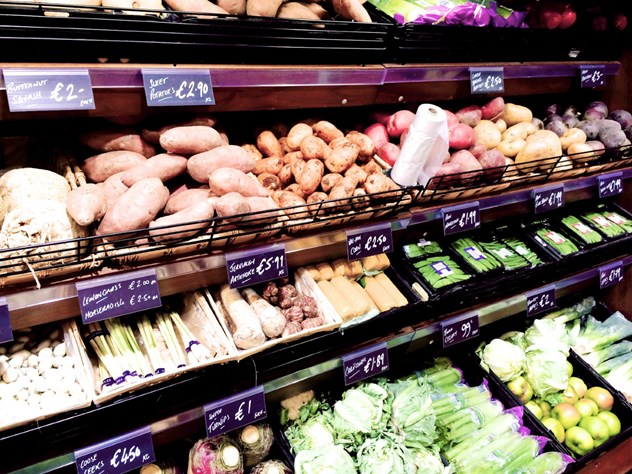 When shopping in your local supermarket it can be difficult to know what is in season as they have fruit and vegetables from all over the world. When possible, is it best to eat in seasonal local produces. Click here to see what fruit and vegetables are in season. I would be a big fan of eating what's in season because you know you are getting fresh food and the optimal nutrition for your children. All seasonal fruit and vegetables taste their best and are nutritionally highest when sourced locally. If this is not possible and a fruit or vegetable is not grown in Ireland, foods labelled from somewhere in Europe (within season) are the next best option. If the foods are loose or in trays, check the tray's label to find out where it is from. Welcome the Spring with some seasonal cauliflower! These Cauliflower and Cheese Bites are perfect for little fingers. Stack and store in an Adult Portion Pot for a tasty baby led weaning snack the family can enjoy throughout the week. They make a great finger food for lunchboxes too! Strawberries taste great in the summer months, but eating them in February is not what nature intended. This goes for all fruits and vegetables! We are fortunate enough to have an abundance of fresh fruits and vegetables sourced locally, so make the most of them. You will taste the difference, and your weaning baby will too! This tasty Ratatouille recipe is great to boost the intake of summer veggies! Great to batch cook and freeze in a Double Child Portion Pot for a fresh taste of summer produce as Autumn rolls in. Trying new and exciting seasonal fruit and vegetables encourages you and your little ones to get that essential five a day portion in. It can be a fun way to introduce foods your child may not have tried before or be used to eating. Get the kids involved with tasks as simple as washing or peeling some veg. Our Healthy Broccoli Tots are perfect to make the most of the broccoli season from late Summer right through to late Autumn. By introducing a wide variety of fruit and vegetables into your baby’s diet they will be less likely to refuse the same food as a toddler. This is easiest when you are eating seasonal produce, because as the seasons change, so will the foods that appear on their plates. What better way to include some winter celery, carrots and parsnips then with a hearty Winter Warmer Stew. This recipe is perfect to freeze and enjoy throughout the colder months for a tasty baby led weaning meal your whole family will enjoy any night of the week. Double up and store in portioned batches with your Toddler Portion Pots for your little ones.